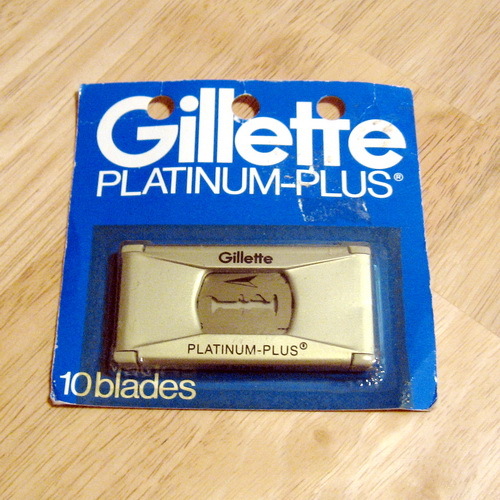 (01-22-2019, 03:39 PM)churchilllafemme Wrote: I picked up a few vintage Gillette Platinum Plus blades. It has been a long time since I have used any of them, and I thought I'd do an informal comparison of them to my Personna 74 Tungstens, Gillette Swedes, and Wilkinson Light Brigades, just out of curiosity. I have found them to be pretty much as I remembered, very sharp and efficient but slightly harsh, somewhat less smooth than Personna 74 Tungstens or Wilkinson Light Brigades. They glided well without drag, but they left me with some skin burn. Their longevity not as great: the blade lasts about 18 shaves, whereas the P74s and LBs last me for 24. I find the same, although I wouldn't use the word harsh to describe them, for me. Less smooth surely but still very comfortable. No skin burn. They are in my grouping of second favorite blades, first group being the two you mentioned.